This pink wrist band represents the millions of strides we have made in the fight against breast cancer with the support of people like you. Help the American Cancer Society continue to unravel the mystery of how breast cancer begins and seek better ways to prevent, detect, and treat the disease that will claim more than 40,000 lives in 2004 alone. 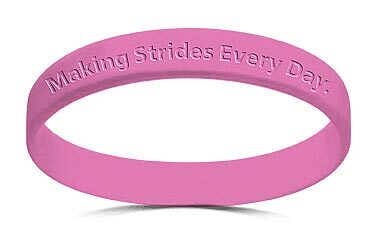 Wear the "Making Strides Every Day" wrist band to support those undergoing treatment, to honor those who have been lost, and to celebrate those who have survived. Give wrist bands to your friends and family to get them involved in the fight and to remind women age 40 and older to get their annual mammogram. For more information about breast cancer, as well as to view the American Cancer Society's prevention and early detection guidelines, please visit www.cancer.org. Join the Making Strides Against Breast Cancer walk in October. To find a walk in your area, visit www.cancer.org/stridesonline.